By-products of fossil fuel power plant operation must be considered in their design and operation. The flue gas from combustion of the fossil fuels is discharged to the air. This gas contains carbon dioxide and water vapor, as well as other substances such as nitrogen oxides (NOx), sulfur oxides (SOx), mercury, traces of other metals, and, for coal-fired plants, fly ash. Solid waste ash from coal-fired boilers must also be removed. Some coal ash can be recycled for building materials. Fossil fueled power stations are major emitters of carbon dioxide (CO2), a greenhouse gas which is a major contributor to global warming. The results of a recent study show that the net income available to shareholders of large companies could see a significant reduction from the greenhouse gas emissions liability related to only natural disasters in the United States from a single coal-fired power plant. However, as of 2015, no such cases have awarded damages in the United States. Per unit of electric energy, brown coal emits nearly two times as much CO2 as natural gas, and black coal emits somewhat less than brown. Carbon capture and storage of emissions has been proposed to limit the environmental impact of fossil fuel power stations, but it is still at a demonstration stage. In a fossil fuel power plant the chemical energy stored in fossil fuels such as coal, fuel oil, natural gas or oil shale and oxygen of the air is converted successively into thermal energy, mechanical energy and, finally, electrical energy. Each fossil fuel power plant is a complex, custom-designed system. Construction costs, as of 2004[update], run to US$1,300 per kilowatt, or $650 million for a 500 MWe unit. Multiple generating units may be built at a single site for more efficient use of land, natural resources and labor. Most thermal power stations in the world use fossil fuel, outnumbering nuclear, geothermal, biomass, or solar thermal plants. Practical fossil fuels stations operating as heat engines cannot exceed the Carnot cycle limit for conversion of heat energy into useful work. Fuel cells do not have the same thermodynamic limits as they are not heat engines. The efficiency of a fossil fuel plant may be expressed as its heat rate, expressed in BTU/kilowatthour or megajoules/kilowatthour. In a steam turbine power plant, fuel is burned in a furnace and the hot gasses flow through a boiler. Water is converted to steam in the boiler; additional heating stages may be included to superheat the steam. The hot steam is sent through controlling valves to a turbine. As the steam expands and cools, its energy is transferred to the turbine blades which turn a generator. The spent steam has very low pressure and energy content; this water vapor is fed through a condenser, which removes heat from the steam . The condensed water is then pumped into the boiler to repeat the cycle. Emissions from the boiler include carbon dioxide, oxides of sulfur, and fly ash from non-combustible substances in the fuel. Waste heat from the condenser is transferred either to the air, or sometimes to a cooling pond, lake or river. Historically, the first central stations used reciprocating steam engines to drive generators. As the size of the electrical load to be served grew, reciprocating units became too large and cumbersome to install economically. The steam turbine rapidly displaced all reciprocating engines in central station service. Coal is the most abundant fossil fuel on the planet, and widely used as the source of energy in thermal power stations. It is a relatively cheap fuel, with some of the largest deposits in regions that are stable politically, such as China, India and the United States. This contrasts with natural gas, the largest deposits of which are located in Russia, Iran, Qatar, Turkmenistan and the US. Solid coal cannot directly replace natural gas or petroleum in most applications, petroleum is mostly used for transportation and the natural gas not used for electricity generation is used for space, water and industrial heating. Coal can be converted to gas or liquid fuel, but the efficiencies and economics of such processes can make them unfeasible. Vehicles or heaters may require modification to use coal-derived fuels. Coal is an impure fuel and produces more greenhouse gas and pollution than an equivalent amount of petroleum or natural gas. For instance, the operation of a 1000-MWe coal-fired power plant results in a nuclear radiation dose of 490 person-rem/year, compared to 136 person-rem/year, for an equivalent nuclear power plant including uranium mining, reactor operation and waste disposal. As of 2009[update] the largest coal-fired power station is Taichung Power Plant in Taiwan. The world's most energy-efficient coal-fired power plant is the Avedøre Power Station in Denmark. Coal is delivered by highway truck, rail, barge, collier ship or coal slurry pipeline. Some plants are even built near coal mines and coal is delivered by conveyors. A large coal train called a "unit train" may be 2 kilometres (1.2 mi) long, containing 130-140 cars with around 100 tonnes (98 long tons; 110 short tons) of coal in each one, for a total load of over 10,000 tonnes (9,800 long tons; 11,000 short tons). A large plant under full load requires at least one coal delivery this size every day. Plants may get as many as three to five trains a day, especially in "peak season" during the hottest summer or coldest winter months (depending on local climate) when power consumption is high. A large thermal power plant such as the now decommissioned Nanticoke, Ontario stores several million metric tons of coal for winter use when the lakes are frozen. A collier (cargo ship carrying coal) may hold 40,000 long tons of coal and takes several days to unload. Some colliers carry their own conveying equipment to unload their own bunkers; others depend on equipment at the plant. For transporting coal in calmer waters, such as rivers and lakes, flat-bottomed barges are often used. Barges are usually unpowered and must be moved by tugboats or towboats. Coal is prepared for use by crushing the rough coal to pieces less than 2 inches (5 cm) in size. The coal is then transported from the storage yard to in-plant storage silos by conveyor belts at rates up to 4,000 short tons per hour. In plants that burn pulverized coal, silos feed coal to pulverizers (coal mills) that take the larger 2-inch (51 mm) pieces, grind them to the consistency of talcum powder, sort them, and mix them with primary combustion air which transports the coal to the boiler furnace and preheats the coal in order to drive off excess moisture content. A 500 MWe plant may have six such pulverizers, five of which can supply coal to the furnace at 250 tons per hour under full load. Natural gas may be burned in steam boilers, gas turbines, or reciprocating engines. Sometimes coal-fired steam plants are refitted to use natural gas to reduce net carbon dioxide emissions. Oil-fuelled plants may be converted to natural gas to lower operating cost. The dash for gas occurred in the 1990s and was when 30 gas-fired power stations were built in Britain due to plentiful gas supplies from North Sea oil wells. According to the 2012 forecast by the U.S. Energy Information Administration, 27 gigawatts of capacity from coal-fired generators is to be retired from 175 US coal-fired power plants before 2016. Natural gas showed a corresponding jump, increasing by a third over 2011. Some coal power plants such as the 1200 MW Hearn Generating Station have stopped burning coal by switching the plant to natural gas. Coal's share of electricity generation dropped to just over 36%. Natural gas accounted for 81% of new power generation in the US between 2000 and 2010. Coal-fired generation puts out about twice the amount of carbon dioxide - around 2,000 pounds for every megawatt hour generated - than electricity generated by burning natural gas at 1,100 pounds of greenhouse gas per megawatt hour. As the fuel mix in the United States has changed to reduce coal and increase natural gas generation, carbon dioxide emissions have unexpectedly fallen. Carbon dioxide measured in the first quarter of 2012 was the lowest recorded of any year since 1992. The list of natural gas power stations has over 100 power stations that generate between 100 MW and 5,600 MW of electricity. Natural gas plants are increasing in popularity and in 2014 generated 22% of the worlds total electricity. Heavy fuel oil was once a significant source of energy for electric power generation. After oil price increases of the 1970's, oil was displaced by coal and later natural gas. Distillate oil is still important as the fuel source for diesel engine power plants used especially in isolated communities not interconnected to a grid. Liquid fuels may also be used by gas turbine power plants, especially for peaking or emergency service. Of the three fossil fuel sources, oil has the advantages of easier transportation and handling than solid coal, and easier on-site storage than natural gas. Combined heat and power (CHP), also known as cogeneration, is the use of a thermal power station to provide both electric power and heat (the latter being used, for example, for district heating purposes). This technology is practiced not only for domestic heating (low temperature) but also for industrial process heat, which is often high temperature heat. Calculations show that Combined Heat and Power District Heating (CHPDH) is the cheapest method in reducing (but not eliminating) carbon emissions, if conventional fossil fuels remain to be burned. Thermal power plants are one of the main artificial sources of producing toxic gases and particulate matter. Fossil fuel power plants cause the emission of pollutants such as NOx, SOx, CO2, CO, PM, organic gases and polycyclic aromatic hydrocarbons. World organizations and international agencies, like the IEA, are concerned about the environmental impact of burning fossil fuels, and coal in particular. The combustion of coal contributes the most to acid rain and air pollution, and has been connected with global warming. Due to the chemical composition of coal there are difficulties in removing impurities from the solid fuel prior to its combustion. Modern day coal power plants pollute less than older designs due to new "scrubber" technologies that filter the exhaust air in smoke stacks. However, emission levels of various pollutants are still on average several times greater than natural gas power plants and the scrubbers transfer the captured pollutants to wastewater, which still requires treatment in order to avoid pollution of receiving water bodies. In these modern designs, pollution from coal-fired power plants comes from the emission of gases such as carbon dioxide, nitrogen oxides, and sulfur dioxide into the air, as well a significant volume of wastewater which may contain lead, mercury, cadmium and chromium, as well as arsenic, selenium and nitrogen compounds (nitrates and nitrites). Electricity generation using carbon-based fuels is responsible for a large fraction of carbon dioxide (CO2) emissions worldwide and for 34% of U.S. man-made carbon dioxide emissions in 2010. 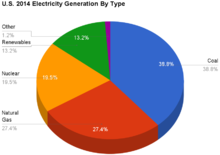 In the U.S. 70% of electricity is generated by combustion of fossil fuels. Coal contains more carbon than oil or natural gas fossil fuels, resulting in greater volumes of carbon dioxide emissions per unit of electricity generated. In 2010, coal contributed about 81% of CO2 emissions from generation and contributed about 45% of the electricity generated in the United States. In 2000, the carbon intensity (CO2 emissions) of U.S. coal thermal combustion was 2249 lbs/MWh (1,029 kg/MWh) while the carbon intensity of U.S. oil thermal generation was 1672 lb/MWh (758 kg/MWh or 211 kg/GJ) and the carbon intensity of U.S. natural gas thermal production was 1135 lb/MWh (515 kg/MWh or 143 kg/GJ). The Intergovernmental Panel on Climate Change (IPCC) reports that increased quantities of the greenhouse gas carbon dioxide within the atmosphere will "very likely" lead to higher average temperatures on a global scale (global warming). Concerns regarding the potential for such warming to change the global climate prompted IPCC recommendations calling for large cuts to CO2 emissions worldwide. Emissions can be reduced with higher combustion temperatures, yielding more efficient production of electricity within the cycle. Carbon capture and storage (CCS) of emissions from coal-fired power stations is another alternative but the technology is still being developed and will increase the cost of fossil fuel-based production of electricity. CCS may not be economically viable, unless the price of emitting CO2 to the atmosphere rises. where "capacity" is the "nameplate capacity" or the maximum allowed output of the plant, "capacity factor" or "load factor" is a measure of the amount of power that a plant produces compared with the amount it would produce if operated at its rated capacity nonstop, heat rate is thermal energy in/electrical energy out, emission intensity (also called emission factor) is the CO2 emitted per unit of heat generated for a particular fuel. Thus the example power station is estimated to emit about 6 megatonnes of carbon dioxide each year. The results of similar estimations are mapped by organisations such as Coalswarm, CarbonTracker and ElectricityMap. The baghouse has a fine filter that collects the ash particles, electrostatic precipitators use an electric field to trap ash particles on high-voltage plates, and cyclone collectors use centrifugal force to trap particles to the walls. A recent study indicates that sulfur emissions from fossil fueled power stations in China may have caused a 10-year lull in global warming (1998-2008). Fossil-fuel power stations, particularly coal-fired plants, are a major source of industrial wastewater. Wastewater streams include flue-gas desulfurization, fly ash, bottom ash and flue gas mercury control. Plants with air pollution controls such as wet scrubbers typically transfer the captured pollutants to the wastewater stream. Ash ponds, a type of surface impoundment, are a widely used treatment technology at coal-fired plants. These ponds use gravity to settle out large particulates (measured as total suspended solids) from power plant wastewater. This technology does not treat dissolved pollutants. Power stations use additional technologies to control pollutants, depending on the particular wastestream in the plant. These include dry ash handling, closed-loop ash recycling, chemical precipitation, biological treatment (such as an activated sludge process), membrane systems, and evaporation-crystallization systems. Technological advancements in ion exchange membranes and electrodialysis systems has enabled high efficiency treatment of flue-gas desulfurization wastewater to meet recent EPA discharge limits. Coal is a sedimentary rock formed primarily from accumulated plant matter, and it includes many inorganic minerals and elements which were deposited along with organic material during its formation. As the rest of the Earth's crust, coal also contains low levels of uranium, thorium, and other naturally occurring radioactive isotopes whose release into the environment leads to radioactive contamination. While these substances are present as very small trace impurities, enough coal is burned that significant amounts of these substances are released. A 1,000 MW coal-burning power plant could have an uncontrolled release of as much as 5.2 metric tons per year of uranium (containing 74 pounds (34 kg) of uranium-235) and 12.8 metric tons per year of thorium. In comparison, a 1,000 MW nuclear plant will generate about 30 metric tons of high-level radioactive solid packed waste per year. It is estimated that during 1982, US coal burning released 155 times as much uncontrolled radioactivity into the atmosphere as the Three Mile Island incident. The collective radioactivity resulting from all coal burning worldwide between 1937 and 2040 is estimated to be 2,700,000 curies or 0.101 EBq. During normal operation, the effective dose equivalent from coal plants is 100 times that from nuclear plants. Normal operation however, is a deceiving baseline for comparison: just the Chernobyl nuclear disaster released, in iodine-131 alone, an estimated 1.76 EBq. of radioactivity, a value one order of magnitude above this value for total emissions from all coal burned within a century, while the iodine-131, the major radioactive substance which comes out in accident situations, has a half life of just 8 days. Several methods exist to improve the efficiency of fossil fuel power plants. A frequently used and cost-efficient method is to convert a plant to run on a different fuel. This includes conversions of coal power plants to biomass or waste and conversions of natural gas power plants to biogas. Conversions of coal powered power plants to waste-fired power plants have an extra benefit in that they can reduce landfilling. In addition, waste-fired power plants can be equipped with material recovery, which is also beneficial to the environment. In some instances, torrefaction of biomass may be needed if biomass is the material the converted fossil fuel power plant will be using. Coal Pollution Mitigation is a process whereby coal is chemically washed of minerals and impurities, sometimes gasified, burned and the resulting flue gases treated with steam, with the purpose of removing sulfur dioxide, and reburned so as to make the carbon dioxide in the flue gas economically recoverable, and storable underground (the latter of which is called "carbon capture and storage"). The coal industry uses the term "clean coal" to describe technologies designed to enhance both the efficiency and the environmental acceptability of coal extraction, preparation and use, but has provided no specific quantitative limits on any emissions, particularly carbon dioxide. Whereas contaminants like sulfur or mercury can be removed from coal, carbon cannot be effectively removed while still leaving a usable fuel, and clean coal plants without carbon sequestration and storage do not significantly reduce carbon dioxide emissions. James Hansen in an open letter to U.S. President Barack Obama has advocated a "moratorium and phase-out of coal plants that do not capture and store CO2". In his book Storms of My Grandchildren, similarly, Hansen discusses his Declaration of Stewardship the first principle of which requires "a moratorium on coal-fired power plants that do not capture and sequester carbon dioxide". Gas-fired power plants can also be modified to run on hydrogen, the latter of which can be created on-site from natural gas. Since 2013, the conversion process has been improved by scientists at Karlsruhe Liquid-metal Laboratory (KALLA) as they succeeded in allowing the soot to be easily removed (soot is a byproduct of the process and damaged the working parts in the past -most notably the nickel-iron-cobaltcatalyst-). The soot (which contains the carbon) can then be stored underground and is not released into the atmosphere. Alternatives to fossil fuel power plants include nuclear power, solar power, geothermal power, wind power, hydropower, biomass power plants and other renewable energies (see non-carbon economy). Some of these are proven technologies on an industrial scale (i.e. nuclear, wind, tidal, hydroelectric and biomass fired power) others are still in prototype form. Generally, the cost of electrical energy produced by non fossil fuel burning power plants is greater than that produced by burning fossil fuels. This statement however only includes the cost to produce the electrical energy and does not take into account indirect costs associated with the many pollutants created by burning fossil fuels (e.g. increased hospital admissions due to respiratory diseases caused by fine smoke particles). ^ Charles Camp; Department of Civil Engineering. "PCA Manual" (PDF). University of Memphis, Herff College of Civil Engineering. Retrieved 8 January 2013. ^ Heidari, N.; Pearce, J. M. (2016). "A Review of Greenhouse Gas Emission Liabilities as the Value of Renewable Energy for Mitigating Lawsuits for Climate Change Related Damages". Renewable and Sustainable Energy Reviews. 55: 899–908. doi:10.1016/j.rser.2015.11.025. ^ Sonal Patel (4 January 2017). "Who Has the World's Most Efficient Coal Power Plant Fleet?". Retrieved 5 September 2018. ^ "Electric Generation Efficiency: Working Document of the NPC Global Oil & Gas Study" (PDF). National Petroleum Council. 18 July 2007. p. 5. Archived from the original (PDF) on 2010-07-04. Retrieved 18 July 2007. ^ Trivelpiece, Alvin (1993). "The Future of Nuclear Research Centers" (PDF). Oak Ridge National Laboratory Review. 26 (3 & 4): 28. ^ Gerhardt, Tina (1 November 2012). "Record Number of Coal Power Plants Retire". E-Magazine. Archived from the original on 1 November 2012. ^ Nuwer, Rachel (August 17, 2012). "A 20-Year Low in U.S. Carbon Emissions". ^ 2014 Key World Energy Statistics (PDF) (Report). International Energy Agency. p. 24. Archived from the original (PDF) on 2014-10-21. ^ Fouladi Fard, Reza; Naddafi, K.; Yunesian, M.; Nabizadeh Nodehi, R.; et al. (2016). "The assessment of health impacts and external costs of natural gas-fired power plant of Qom". Environmental Science and Pollution Research. 23 (20): 20922–20936. doi:10.1007/s11356-016-7258-0. PMID 27488708. ^ a b c "Effluent Limitations Guidelines and Standards for the Steam Electric Power Generating Point Source Category". Washington, DC: US Environmental Protection Agency (US EPA). 2015-09-30. ^ "Sources Climate Change". US EPA. 2012. Retrieved August 26, 2012. ^ "Electricity Sector Emissions Climate Change". US EPA. 2012. Retrieved August 26, 2012. ^ Solomon, S.; et al. (2007). "Summary for policymakers" (PDF). A report of Working Group I of the Intergovernmental Panel on Climate Change. IPCC. Retrieved 24 March 2010. ^ Committee on Benefits of DOE R&D on Energy Efficiency and Fossil Energy, US NRC (2001). Energy research at DOE: was it worth it? Energy efficiency and fossil energy research 1978 to 2000. National Academies Press. p. 174. ISBN 978-0-309-07448-3. ^ a b c d Nel, A. (2005, May 6). Air Pollution-Related Illness: Effects of Particles. Science, 308(5723), 804-806. ^ a b c Grahame, T., & Schlesinger, R. (2007, April 15). Health Effects of Airborne Particulate Matter: Do We Know Enough to Consider Regulating Specific Particle Types or Sources?. Inhalation Toxicology, 19(6–7), 457–481. ^ a b c Schobert, H. H. (2002). Energy and Society. New York: Taylor & Francis, 241–255. ^ Freedman, Andrew (July 5, 2011). "New study blames 10-year lull in global warming on China coal use, air pollution". Washington Post. Retrieved 2018-10-29. ^ "Lowering Cost and Waste in Flue Gas Desulfurization Wastewater Treatment". Power Mag. Electric Power. March 2017. Retrieved 6 April 2017. ^ a b c Coal Combustion: Nuclear Resource or Danger? Archived 5 February 2007 at the Wayback Machine by Alex Gabbard, ORNL Review, Summer/Fall 1993, Vol. 26, Nos. 3 and 4. ^ Thompson, Linda. "Vitrification of Nuclear Waste". PH240 - Fall 2010: Introduction to the Physics of Energy. Stanford University. Retrieved 10 August 2014. ^ "Fukushima radioactive fallout nears Chernobyl levels". Newscientist.com. Retrieved 24 April 2011. ^ Barnes, Ian (March 2015). "Upgrading the Efficiency of the World's Coal Fleet to Reduce CO2 Emissions". Cornerstone. ^ ENS (March 15, 2006). "Europe Tests Carbon Capture at Coal-Fired Power Plant". Environment News Service. Retrieved 15 July 2012. ^ Hansen, James (2009). Storms of My Grandchildren. London: Bloomsbury Publishing. p. 242. ISBN 978-1-4088-0745-3.